HAUG's Standard Ion Air Knife is an effective way to eliminate static electricity from webs, sheet stock and plastic surfaces. The Ion Air Knife AK GK belongs to the group of air gates. 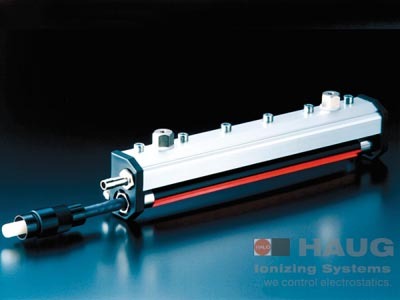 As the name already indicates, these are ionizers which are supported by air flows. The effectiveness of the Air Knife can be explained by the special design of the air discharge nozzle which creates the so-called “coanda effect”. The air discharge speed is increased, resulting in increased effective depth. This in turn permits a greater operating distance of the Air Knife to the material web. The slot jet has a wider angle of dispersion, which is expanded from 24° to 33°. A larger surface is therefore covered with ionizing, neutralizing air. Plastic processing industry: Film processing, packaging machines, sheet extruders, etc. Textile industry: Weaving and spinning mills, textile finishing, etc. Paint shops: Car painting, painting of plastic components, etc. In contrast to full jet nozzles, with the “coanda effect” the ionized air comes out of a slotted nozzle producing a flat jet. The special construction of the bottom-side of the Air Knife causes an unilateral reduction in injection (air suction from the atmosphere), thus creating negative pressure so that the ionized air is directed to the material web. In contrast to full flow nozzles, ionized air is discharged from a slotted nozzle, creating a flat jet flow. The special construction on the underside of the knife effects a single-sided reduction in the injection (air suction from the atmosphere) which creates a vacuum and ensures that ionized air is directed to the material track. of the Air Knife to the material line. Please order ionizing bar separately. Special lengths on request for special lengths radial air connection.